The Achilles tendon connects the muscles at the back of the calf (the gastrocnemius and the soleus) to the heel bone. As the largest tendon in the human body, it enables you to perform many everyday activities including walking, running and jumping. While it is very strong, it is still susceptible to tearing when overstretched or overexerted. An Achilles tendon rupture, also known as an Achilles tendon tear, occurs when the tendon fibers separate either partially or completely. The rupture often occurs between two and three inches above the spot where the Achilles tendon attaches to the heel bone. This spot is more prone to tearing due to the fact that it receives less blood flow than the surrounding areas. Less frequently, the tendon may tear completely away from the point of attachment on the heel, which may cause a fragment of bone to be pulled away from the heel with it. Most Achilles tendon ruptures happen in a sports-related context and specifically stem from activities involving jumping, running or sudden starts and stops. Additionally, other incidents such as a fall from a considerable height or stepping into a hole could cause a tear. In most cases, you will not be able to walk properly. In addition, you will likely be unable to perform the following activities with your injured leg: point your foot downward, stand on your toes or use your injured leg to push off the ground when taking a step. What are the risk factors for an Achilles tendon rupture? What are the treatment options for an Achilles tendon rupture? If you experience a pop or snap in your lower leg by the heel, you should seek medical attention right away. If you think you may have torn your Achilles tendon, call our office at 212‑434‑4920 so Stuart Katchis, M.D. can evaluate and treat your injury as soon as possible. 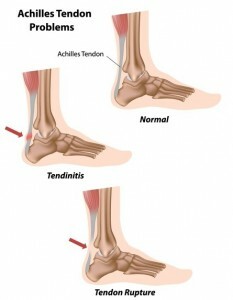 An Achilles tendon tear can be treated with or without surgery. After a thorough evaluation, Dr. Katchis will explain your options and advise you on the best course of treatment for your needs. A nonsurgical Achilles rupture repair involves immobilization of the injured tendon using a cast. The cast will be fabricated so that the foot and ankle are flexed downwards while the heel is elevated to ensure the proper position for healing. Nonsurgical treatment may make the recovery process longer than surgery, but it is still an effective option for certain patients. Achilles tendon surgery may be required if nonsurgical treatment will not prove effective, particularly in cases of more severe ruptures. Younger or middle-aged patients with active lifestyles usually prefer surgery. The surgical procedure involves Stuart Katchis, M.D. reattaching the ends of the tendon back together, which will restore the length and tension of the Achilles tendon once healing is complete. In some cases where the torn tissue is more severely damaged, Achilles reconstruction may require the tendon to be reinforced with other tendons. Following the surgery, usually performed on an outpatient basis, the lower leg and foot will be immobilized using a cast. With both nonsurgical and surgical treatment, physical therapy is an essential part of the recovery process. Dr. Katchis will recommend that patients begin rehabilitation once the tendon shows signs of significant healing. Physical therapy helps rebuild the strength of the injured tendon and the surrounding leg muscles. A full recovery from an Achilles tendon rupture typically takes between four and six months.